I recently purchased and installed a Mercusys router a few weeks ago and below is a short review of how my experience with this product has been so far. In a nutshell, I will say that the router does its job pretty well without any hassle. The price of it is quite reasonable so you do not have to think much before buying it. It is a tiny piece of equipment that takes very less space and is very easy to install. 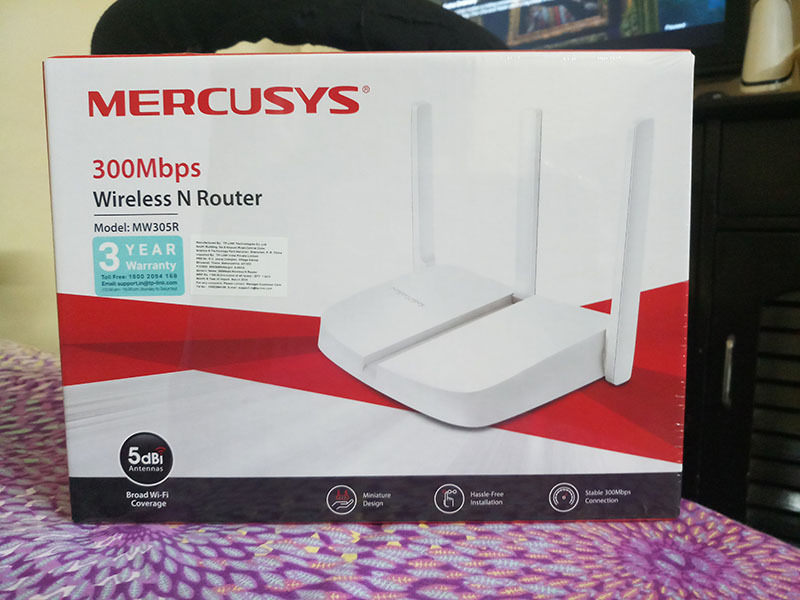 If you are looking to install a router at home or small office for very simple use then Mercusys can prove to be a good choice. Let me first mention how and what my use of the router is. I have it installed at my home with a 50 MBPS Broadband connection. Devices that connect to it are my Desktop, two laptops, and two mobile phones. On a regular basis, it remains connected to at least the desktop, a laptop, and a mobile phone. But sometimes, all 6 devices are connected as well at the same time. Below are a few features of the router as mentioned on the box. So is the router really as good as mentioned in the points above? I will say that yes it is. I bought it online from Amazon; and received the delivery in a couple of days. I do not really have any complaints on this side though. The product received was a brand new router and was packed well. I am not too much of a techie but do have a little bit of knowledge myself. I called my Internet provider and with him on the phone, was able to install the router in less than 10 minutes myself. It is a very small router and does not take much of space. It silently sits there in a corner of my room and I hardly notice it. The price I paid for it at the time of purchase was Rs. 900 which is at par with other routers available in the market. I am not sure how far the connectivity goes because it doesn’t say anything on the box and I too haven’t tried to do any tests as such. But within my house, I have faced no connectivity issues at all. The network remains strong no matter where I am in my house. Click on the Link below to take a look at the product available on Amazon India site. My final word would be that it is a great router for its price. If you are too technical and want a router for some high-end purpose then please look elsewhere. For simple use at home or small office, Mercusys router would be a good choice. It comes with a 3 Year onsite warranty which in my opinion is another great benefit. I hope the review above was of help. If you have any other questions; or need any further details; please feel free to ask in the comments section below; or at our Community Forum; and I will be glad to answer.